Bunching two years of property tax payments in alternate years has been a long-standing tax planning move near the end of the year. The idea is if you don’t itemize your deductions every year, paying for this year’s plus next year’s property tax in one shot can bump you above the standard deduction. Then you get to deduct the excess. 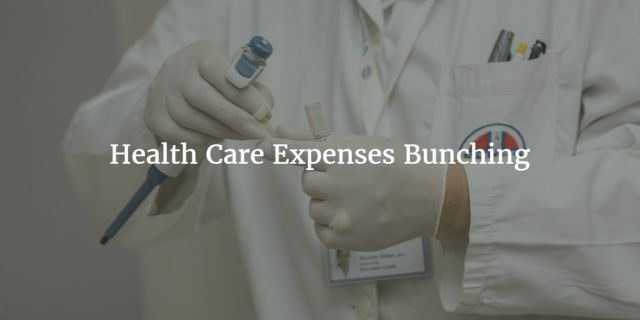 When more and more people have high deductible health insurance, bunching health care expenses near the end of the year has a similar effect. Health plans typically run in calendar years. They go by the date of service. If you have a service you can schedule before the end of the year or in January, you can potentially save some money depending on whether you already met your deductible for the current year. If you already met the deductible this year, having the service in the current year means most of the cost will be covered by insurance. If you do it next year, you will have to meet the deductible again. If you haven’t met the deductible this year and the cost of the service still won’t make you meet the deductible, you are better off scheduling the service next year. When you are not going to meet the deductible this year anyway, you might as well have it count toward next year’s deductible. It can help get some other services next year covered. If you haven’t met the deductible this year but you are close enough that the cost of the service will put you above the deductible, doing it this year will have part of the service covered by insurance, but it also means you will have a bigger hole to fill next year. Which year you do it in will depend on how close you are toward this year’s deductible and how likely you will meet the deductible next year. If you are really close, or if it’s unlikely you will meet the deductible next year, you should probably just do it this year. Again the idea is bunching, which helps you meet the deductible and possibly reach the out of pocket maximum in one year. There are other ways you can take advantage of health care bunching as well. If you expect to be hospitalized and have some flexibility in scheduling (e.g. for back surgery), you may consider deferring the procedure until the next year, especially if it is already near the end of the year. Of course, as the main article points out, if you’re near or at your deductible for this year, having that surgery this year can be a big win. Deferring a big medical expense gives you the opportunity to buy an insurance policy that is “optimized” for major expenses. Often bronze plans are least expensive with even a moderate amount of expenses. That’s because with the ever increasing deductibles, it’s “hard” to exceed even silver plan deductibles. But if you’re pretty sure you’ll pass that threshold, platinum plans often become the least expensive option. They not only have the lowest deductibles, but the lowest out of pocket caps, so your total premiums plus cap can be less with these plans – if you have large medical expenses. Another reason why shifting medical expenses into the next year can help is if you’re planning to retire soon. Medical expenses are deductible only to the extent they exceed 10% (or if you’re old enough, 7.5%) of AGI. If your income will drop next year due to retirement, you stand a better chance of being able to deduct these expenses next year. Keep in mind that as your income drops, state income taxes also drop. That may make it harder to itemize. It becomes more likely that the standard deduction will exceed the total of your itemized deductions (as your state income tax deduction falls). So even though moving medical expenses into the following year for tax purposes seems to make sense, you have to look at all your deductions and plan accordingly. This is a great point! It’s so important to use the benefits you have. For example, I always make sure to use preventive services, like dental cleanings and physicals, since they’re completely covered by my insurance. Meet that deductible and schedule more expensive procedures for the end of the year if you can!